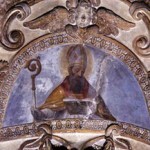 Until 1282 in the ancient Maderno churches were found the relics of St. Ercolano, elected by the Magnificent Patria (with the unanimity of his General Council) as principal patron at the meeting of July 26, 1466, obliging them to celebrate with a feast of precept l ‘Annual memory on August 12th. St.Ercolano from Brescia was born in Germany by Honorato and Arissa, two noble and wealthy parents who for a long time prayed with a devout and charitable son with their neighbor. In the reconstruction of his life, it is often difficult to separate legends from reality as certain news is few; sure he was elected bishop of Brescia in 552 a.C. and was loved by the people. He was attributed to some miraculous facts such as seeing Christ and the Apostles transformed into precious stones; Having returned his life to two dead with his prayers while he was in a monastery in Brescia. He then decided to move to Campione sul Garda in a lonely life, probably because of the invasion of the Longobards who, as heretics, did not see the ecclesiastics of the Italians as good as the same happened to Onorato, Bishop of Milan and Bishop of Aquileja. During his stay in Campione, and even in subsequent centuries, he was esteemed by the rivieraschi and elected to their patron and spiritual guide; At some point in his life, anticipating the end of the end, he got a boat to leave at the lake and the same, with his lifeless body, landed at Maderno. In 1022, according to the bishop of Trento Ulderico II, the calendar of Saints was written and in this it is stated that August 12 is the anniversary of St. Ercolano, confessor of faith and bishop buried in Maderno. This document certifies that since 1022 the remains of Sant’Ercolano were found in Maderno in the church of Sant’Andrea; So the translation of his remains from Campione to Maderno must have taken place between 958 and 1022.